It's an unintentional coincidence that the label 20 Sided Records is run (just like The Funs) by the three gentlemen of Couches. I think every band should start their own label. Honestly what was the reason for giant labels being in the middle of this whole thing? Maybe there was a time when unless you were willing to tour incessantly for years at every random venue and spread by word of mouth there wasn’t another way to interact with fans all over the country. You can be annoyed at the internet but it’s allowed for more DIY than ever before and is worth sifting through worthless gifs and facebook posts to be able to easily track down a label like this. 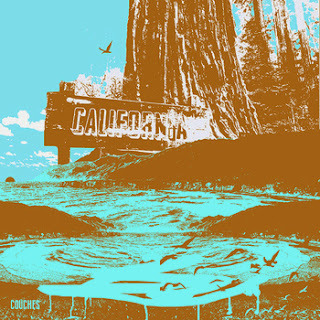 Warm guitar tones open A-Side's "California" with lots of compressed reverb, the vocals get right into singing about the state and you can hear those pilowy strings bouncing around reminding a lot of Pinback’s exaggerated harmonies and over the top production. Two riffs wind back and forth with huge channel separation in the vocal track, making real specific interesting changes. It’s even like Why?’s playful approach to the lyric about his state and weird instrumentation. When this breaks into a heavy sludgy ending for a measure their crisp production is brought into an even tighter focus; the melody shift in the lyric, spreading the notes way apart while that huge metal haze piles in again turning this into earlier decades hard sound. Makes California sounds pretty nice and this track is as sunny and clear as those cloudless days. B-Sides" Killer Mutant Butterfly" opens up the left channel with an understated riff in a bending Built to Spill epic style, the swirly layered guitars all but lying just on the surface of this deep pool. The second the lyric starts the delayed tight melody splinters into a million pieces the vocal finding space between them. It gets hazy just before the sharp, quick verse comes in, making it that much closer to Why? 's weird combinations of genre’s. The way they seemingly ignore trends, they’re off on their own path getting something this unique and separated from anything else. When the hiss is stripped away the clarity of this stands out even more while taking the long way home with this track jamming in every last rotation. It's an extended cut that leaves you wanting to hear more of their controlled chaos. Great interview from Gelatinous Blog over here that got me started on that corporate label rant. Get this from 20 Sided Records.